What is lean manufacturing? The term made its entrance into the business vernacular in 1913 when Henry Ford sought improvements in his manufacturing plant. Later, Toyota discovered other ways to manage manufacturing for a “lean” approach. 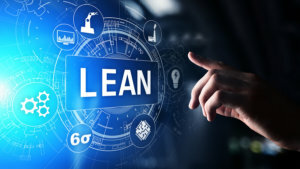 The system of lean manufacturing has made a big impact on the automotive world by minimizing waste, teaching companies to create more value with fewer resources. But it’s no longer relegated to the automotive industry. All manufacturing companies can benefit from the basics of lean manufacturing principles. The focus on continuous improvement and doing more with less resonates with every facet of business, from logistics to retail, construction to government, and especially with manufacturing, where margins are often “lean” to start with and benefit from any improvements. Technology facilitates many aspects of lean manufacturing. Machines are best for repetitive tasks. Automation, for example, replaces manual labor, saves time, and frees people up to work on analytics and problem solving. By using machines for simple tasks, time is freed for workers to use their creativity and problem-solving skills. Digitizing manufacturing is a big trend expected through 2019 and into 2020, as many manufacturing companies are dramatically increasing their digitization and expect to be ranked as digitally advanced by 2020. These same companies are putting their money where their mouth is, committing around five percent of revenues toward that connectivity. How many of the following trends are you implementing in your operation? These are the trend now in the world of manufacturing, and trends which are anticipated to make a big impact. Automation is one of the key points of the entire lean manufacturing concept. Although people often fear that automation takes jobs away from people, the jobs actually shift from simple, repetitive tasks to tasks requiring higher thinking skills. Artificial intelligence (AI) enabled automation could eliminate up to 9 percent of U.S. jobs. However, AI automation also creates other job opportunities that support this new automation economy, from those who can service the equipment to those who will use the data produced by automation to continue improving business and manufacturing processes. Automation thus supports lean manufacturing by allowing companies to run production longer, faster, and with fewer errors than by human power, saving both time and overhead. The Internet of Things (IoT) connects equipment so that it can exchange data with other machines and networks based on activities, sensors, and analytical insights. Boston Consulting Group predicts that by 2020, half of the $267B companies will spend on IoT products, technologies, and services will be driven by industries such as manufacturing. The IoT is geared toward efficiency, reliability, and availability. By using it in the manufacturing industry, the IoT has ushered in a whole new way of converting raw materials into marketable products. Machines have little margin of error. They also don’t need breaks or take sick days. Training? That’s programming, and it can be done once and remembered forever. Machines are reliable and cost-effective. New technology enables manufacturers to save time and bring down labor costs throughout the factory. Machine learning can help your equipment become “smarter” over time and predict the next need. It takes data collected by automated and connected IoT devices and uses it to monitor and predict issues in your manufacturing process. Imagine knowing a machine will need service before it breaks down, based on specific histories of issues on that machine. Other systems read information and find ways to optimize a machine’s productivity, emissions, or other issues even better than a human could. The Internet of Things, Machine Learning, and other new technology are truly reshaping the manufacturing industry. We’ve come a long way since the assembly line days of Henry Ford or the first Toyota lean manufacturing systems. New, better, and more efficient technology continues to improve the outlook for all manufacturing facilities. Emerald TC provides software and consulting for manufacturing companies. We can help you choose the right ERP system for your needs. Contact us or call 678-456-6919 for more information.